We woke up at 5.45am, which for us was almost indecently early, but we'd heard that the Santiago accommodation could be a bit of a bun fight, and besides, apparently the magnificent looking former Benedictine monastery offered a small number of rooms to pilgrims for €23 - including an unlimited breakfast. This sounded like the sort of place worth getting up early for, although I had to resort to dragging Connor out of his top bunk feet first in his sleeping bag to get any sign of life from him. Jonas is definitely the morning man of the two boys. So yes - early start, and we whistled by the distance markers, stopping for breakfast after an hour. But the last ten or so kilometres took an eternity - which wasn't helped by stopping for a decent spell in San Marcos to drink our final Kaz (limón) before reaching the city's centre. 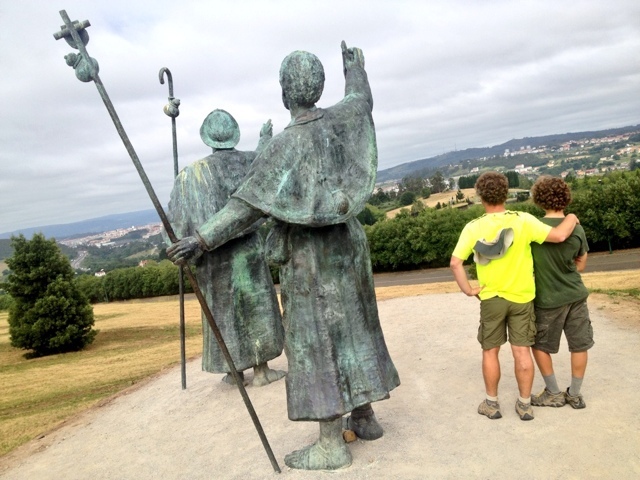 Rupert suddenly realised that San Marcos is the place that had the large Camino statues he'd seen photos of, and we made a ten minute detour to see them - they're not on the route but rather beautiful. And you get a lovely view of Santiago that the main path into town doesn't have. As we covered the final kilometres we passed a guy called Rick from Arkansas, who must have been around 60 years old. He had a very pronounced limp and walked agonisingly slowly, and he told us he'd started from St. Jean Pied-de-Port on May 16th. 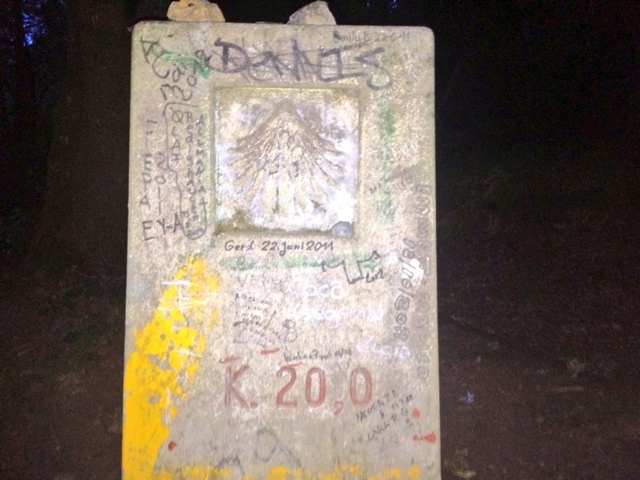 What an incredibly tenacious man to cover the 790km with such a disability, and a timely reminder that walking the Camino is actually relatively easy for someone like me - 35 years old, in good health and fairly fit - but for others it will be one of the most challenging things they've accomplished in their life. We arrived in time to bag the last rooms at the Seminario Mayor - the magnificent old Benedictine monastery, had a quick shower and then walked the final 100 metres into the plaza in front of the cathedral's main facade. I hadn't actually worked out how I'd feel coming face to face with the building that all the various Caminos across Europe converge on. But when the moment came I felt slightly light headed, in all honesty. I sat down cross-legged on the ground about 50 metres away from it, and just took in the building - elaborately decorate architecture, with the plants growing out its crevices lending the building a wonderfully decayed aesthetic. I also looked at my credential (the pilgrims' passport I've had stamped every night since starting from Lourdes) and thought about all the people who have helped me on my way, carefully looking at each stamp and reflecting on my journey. We then headed down to the pilgrim administration office to collect our Compostelas. The lovely old German woman processing my credential shook my hand and said 'well done', which slightly threw me! She then spent about ten minutes of looking increasingly confused, as apparently Lourdes wasn't on their computer system as a registered starting point - much to my surprise given its status as a major Catholic shrine. Someone came out from the back office and rescued the situation, and I received my Compostela, which I'm weirdly rather proud of, along with my credential - full of stamps from the last five weeks. The rest of the day went thus: late lunch, slow drinking until the late evening, then bed - a huge sleep knowing that the only reason to wake up early was to make a head start on the unlimited breakfast put on by the Seminario Mayor.